Anyway, what pleases me here is in part the neatness of the grid of rawlplugs – surely such careful placing must be for a reason, so why is nothing attached to the wall? 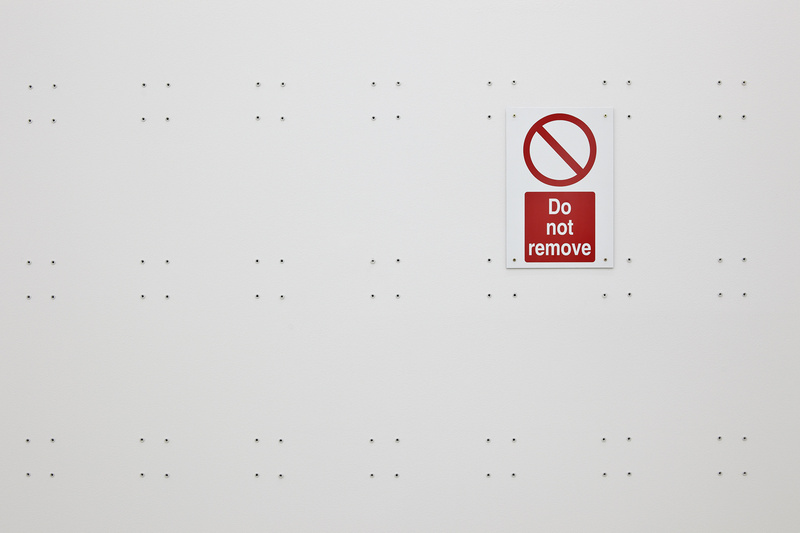 – and that sign: Do Not Remove. Was the grid made to hold stuff to the wall? If so, what? 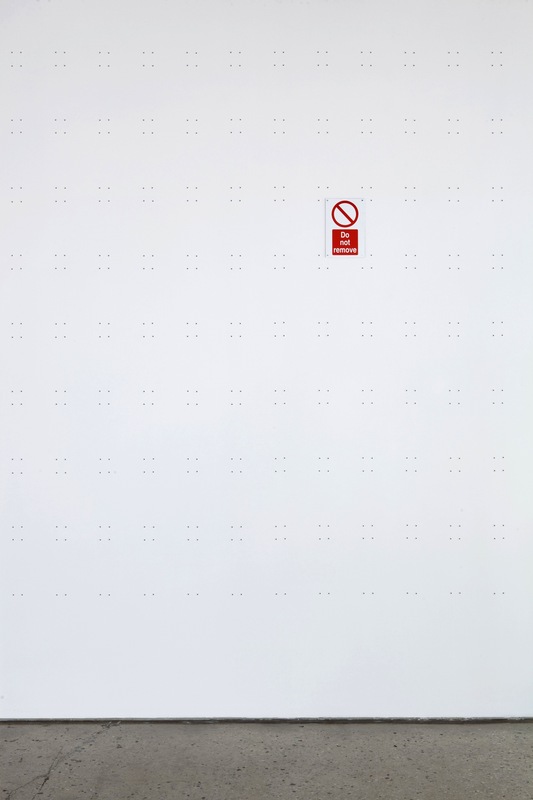 The emptiness of the blank wall is an absence, it’s just that we have no way of knowing what might be missing. It seems clear that the sign was wilfully ignored. Or was it? The sign of course fits the grid perfectly and it’s using one quartet of rawlplugs so it’s not telling us to leave what’s (no longer?) there; it’s part of the system. 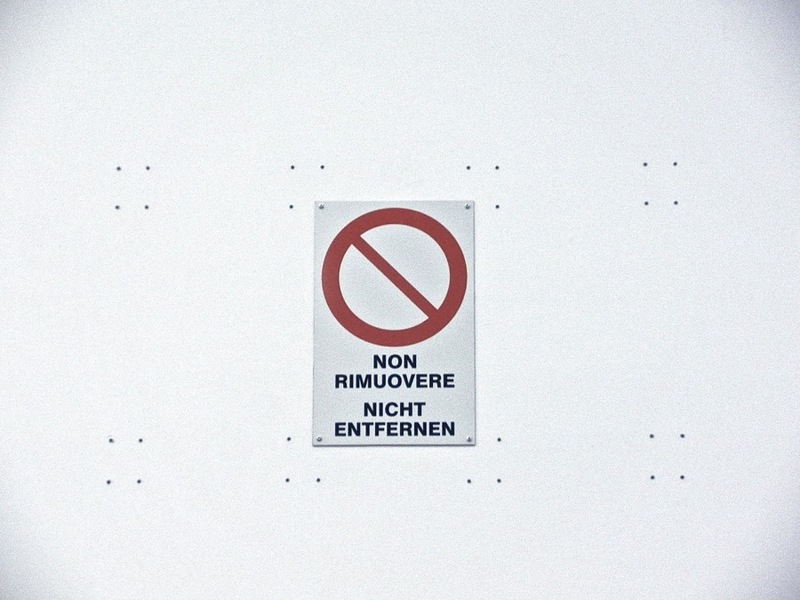 And, of course, given that signs need to be understood, this is a work that changes depending on where it’s shown. The sign itself is a readymade and, as with the receipt, it’s repurchased local to where the work is shown in the appropriate language, otherwise how would visitors know not to remove anything? There’s a neatness to all this that pleases me. But then, as has long since been established here, I’m easily pleased. This entry was posted in Conceptual art, Installation, Text and tagged art, Ceal Floyer, conceptual art, Do Not Remove, installation, signs by Ann Jones. Bookmark the permalink.